I am not a (graphic) designer. 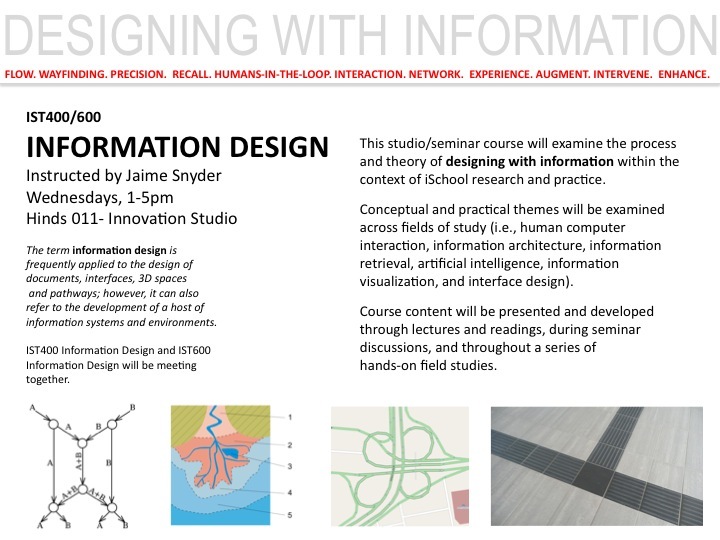 I just finished my first semester teaching a brand new graduate-level course that I created called Information Design. The School of Information Studies at Syracuse University generously allowed me try out this new offering and I was delighted to get a full class the first time out of the gate. Based on a show of hands on the first day of class, most of the students expected the course to focus on graphic design and visualizing information. But information design means something more than that to me and I tried to make this class reflect that. Fortunately I didn’t scare away too many students on that first day. In fact, I’ve found that most people assume that when you start talking about design, you mean visual design. I run into this a lot, especially since my area of academic research is visual information and the majority of my formal education is in visual art. It is easy to see why I often get mistaken for a graphic designer. When it happens, I usually say something like, “Oh, no, I’m not a designer, I’m actually trained as a painter…” People outside of the art & design community generally respond with something like “Oh, whatever, it’s all the same, your one of those visual/art-y/bohemian people, right?” For people inside the art & design community, my statement is met with a knowing smile accompanied by a decided drop in my credibility. Painters are not designers (and generally can’t design their way out of a paper bag). Everyone knows that. So whenever I talk about designing with information, I try to be very upfront about the fact that I do not consider myself a graphic designer. In reality, my formal training in this area is limited to the obligatory design courses that were taught as part of my undergraduate foundations program at art school. At the time, I wasn’t particularly interested in these graphic design classes, strongly preferring the visceral experience of working in the painting studio. Fortunately, I got a chance to supplemented this neglected part of my education during the several years I worked for various design firms an interactive producer and information architect. My web development teams always included at least one visual designer and this exposed me to some highly skilled and articulate typographers, graphic designers and creative directors. While one of my primary jobs was to organize the information to be presented through a website (designing the information architecture), the visual designers focused on crafting the graphical user interface (GUI) through which the information would be accessed. It was while collaborating with these folks that I really came to understand how little I knew about graphic design. It actually came as a little bit of a surprise to me. I mean, really! I’ve been a practicing visual artist for years! I spent many years studying painting! I know color. I know shape. I know balance, composition, rhythm. I can draw! But what I learned by watching gifted graphic designers work is that while we shared a similar visual language, my accent was all wrong. My eyes were not trained to the same calibration as theirs. During the time I worked in industry, on occasion, when the schedule was very tight, I would be the one tasked with making an initial mock-up of an interface design, or with making edits to an existing file, just to keep the ball rolling. Then I’d take the file to the real designer who would thankfully fix it: adjusting the colors by barely imperceptible degrees; shifting a block of text 10 pixels to the left; moving a photo up by a 8 pixels; taking away a border here; increasing the space between two letters in the header by a couple of pixels. The impact of several relatively small changes was huge and undeniable (and actually kind of magical sometimes). The transformation was evidence of their craftsmanship. However, I have and do design with information. It’s just not always visual information. Probably because I have been so focused on the kind of designer that I am not, this is actually a relatively recent revelation for me, and I am still a bit tentative about saying it out loud. After spending years fighting the label of designer (for precisely the reasons described above), not long ago I realized it might be possible to be an experienced information designer without being a gifted graphic designer… And that there is a lot to be gained from separating the two practices: graphic design and information design. Getting back to my Information Design course, when I began to plan the class, I wanted to explore this idea. For that reason, we actually only spent about a third of the semester talking about specifically visual concepts and principles. What did we do the rest of the time? Well, here’s the syllabus, you can see for yourself. The students learned how to think about information separate from computers and technology, to recognize real, living information and information systems in their environment (we referred to it as “in the wild”) , to identify all the components of those systems, and then to take an action that would somehow influence or change that the flow of information through that system. It was a great semester and I think I learned as much or more than the students did. I’m looking forward to teaching it again next spring. One Response to I am not a (graphic) designer.